The “House of the Lord”, Kirtland, Ohio. October 24, 2004. When I lived in Ohio I would be in kirtland in the fall almost ever year. The fall colors were especially vibrant the year I took this photo. This is my favorite image for October 24. The “House of the Lord”, as it was originally called, is on the National Register of Historic Places. It was built and dedicated in the 1830s by Joseph Smith, Jr. and his followers. 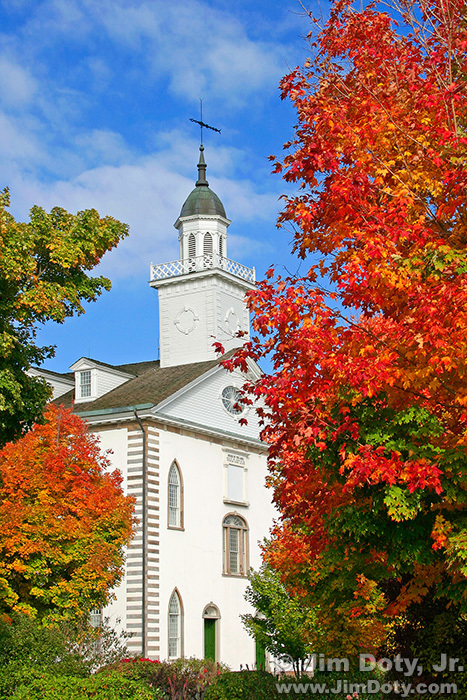 Today it is often called the “Kirtland Temple”. Some of the trees in this image were removed when the new visitor’s center was built so this exact view is no longer possible, making this image all the more special to me. If I went back on another fall day with the same spectacular color and put my tripod in the exact same spot, I could not re-create this image. You can wander the grounds outside and take pictures. To go inside you need to take the guided tour that starts at the visitor’s center. 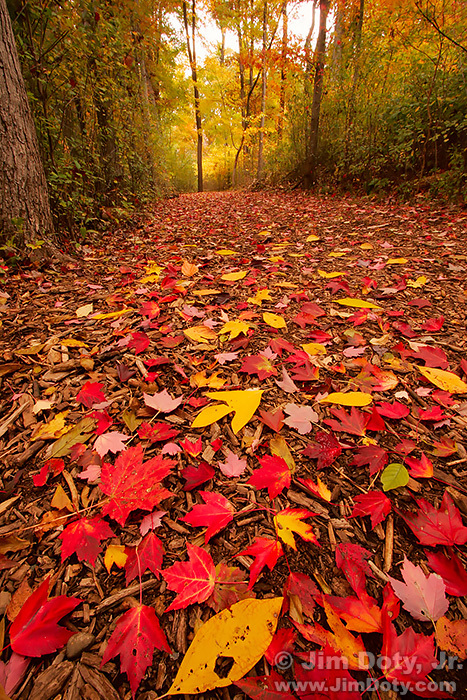 Autumn Path, West Lake Nature Preserve, Portage, Michigan. October 24, 2005. When I lived in Michigan the West Lake Nature Preserve was just a few minutes from my home. It was a little slice of northern Michigan wilderness surrounded by a southern Michigan city. I wandered the paths on a regular basis, camera in hand. I missed this place after we moved. I was back in Michigan visiting family and friends so I went back to West Lake. A beautiful carpet of leaves covered everything. This is my second place favorite photo for October 24. If you are in or near Portage, Michigan, the West Lake Nature Preserve is a great place to take photos in any season of the year. This entry was posted in General, Photo Locations, Photographs by Jim. Bookmark the permalink.